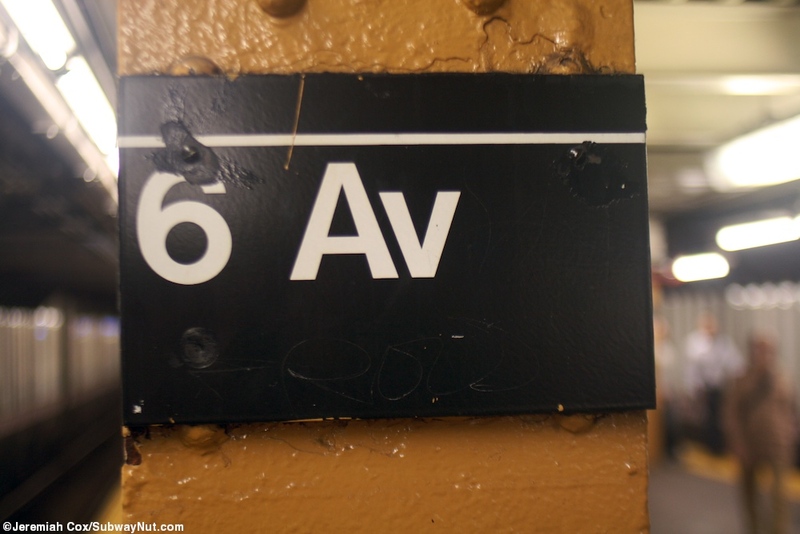 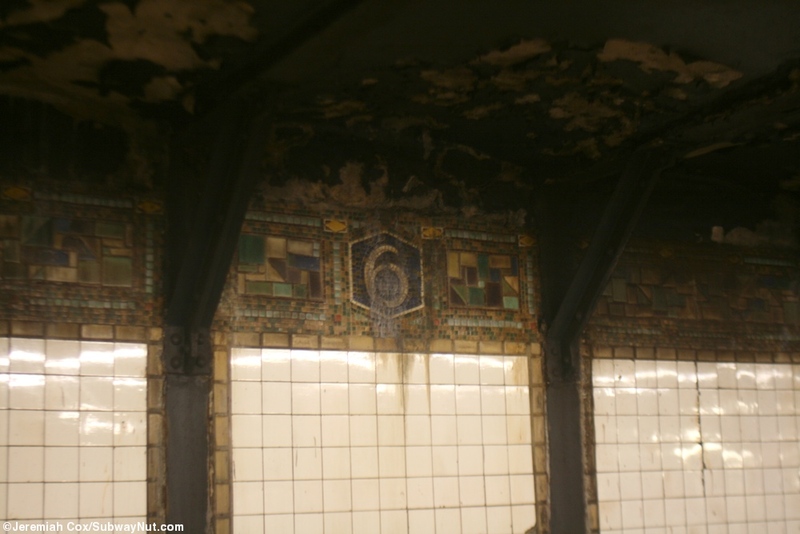 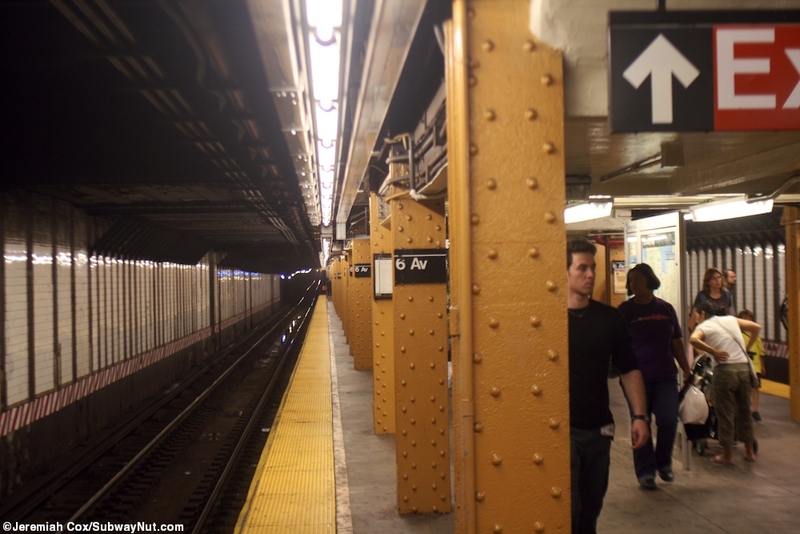 The L train has a single island platform at 6 Avenue, this platform has lines of yellow columns and is fairly deep with little 6s in the standard BMT brownish motif. 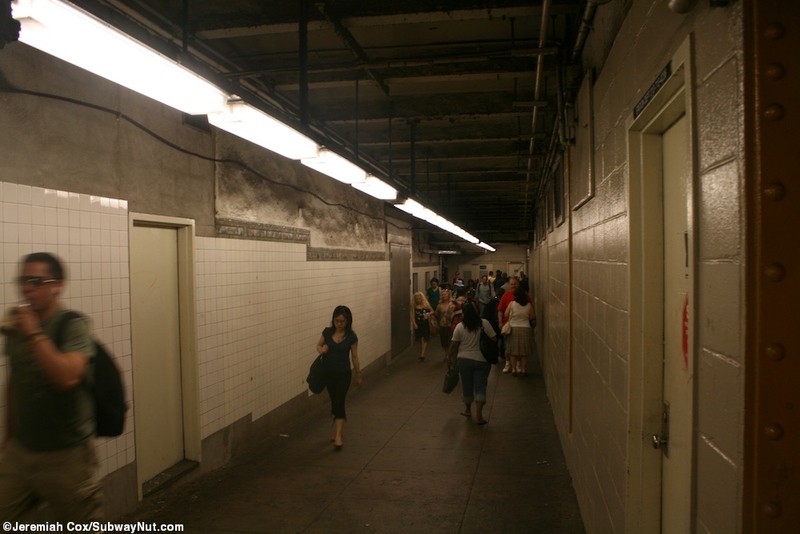 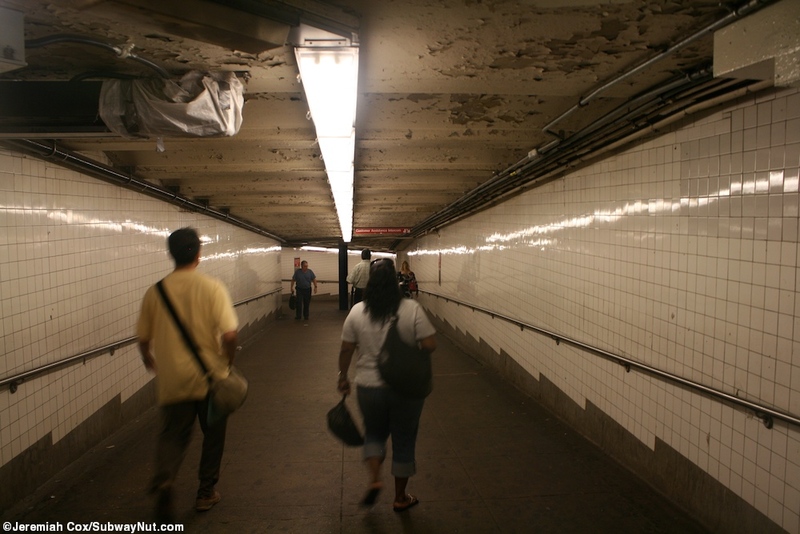 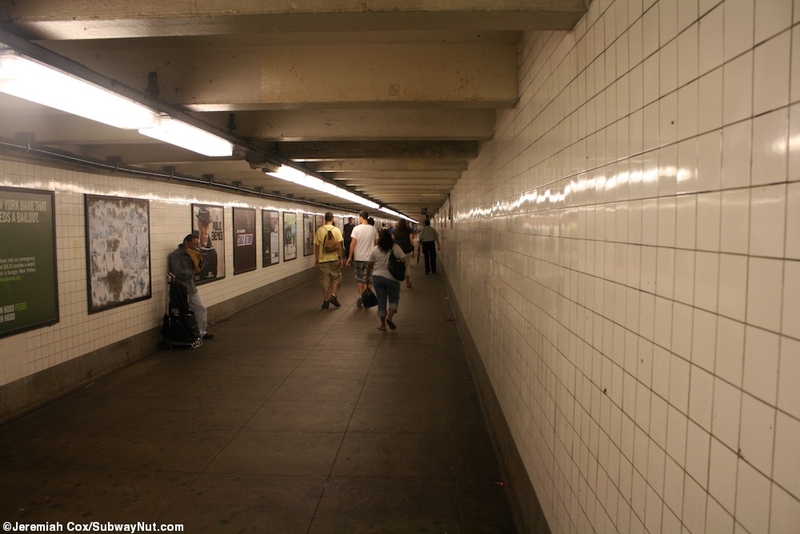 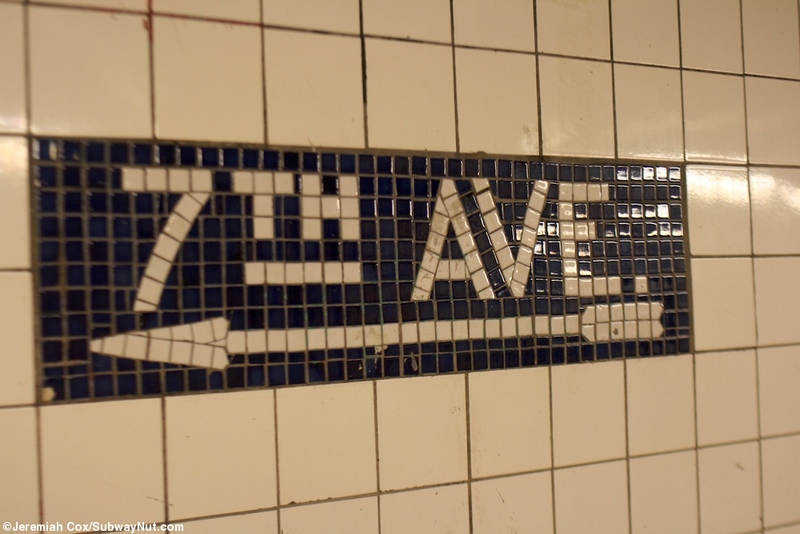 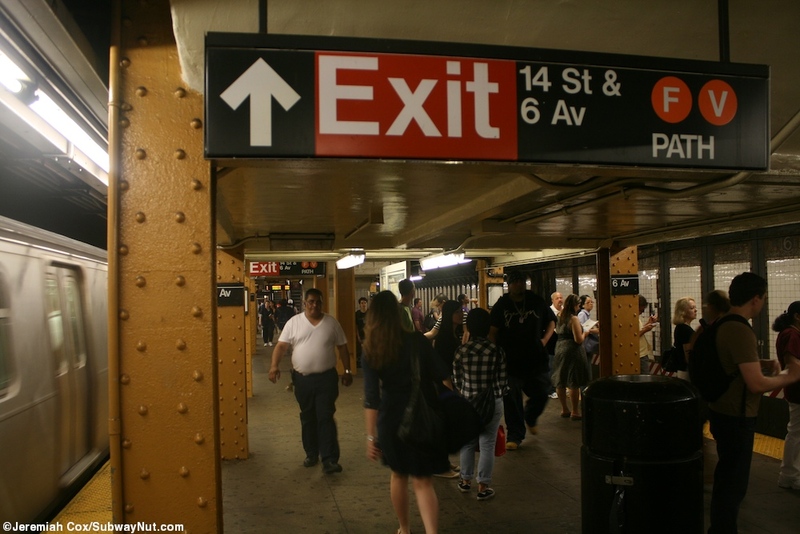 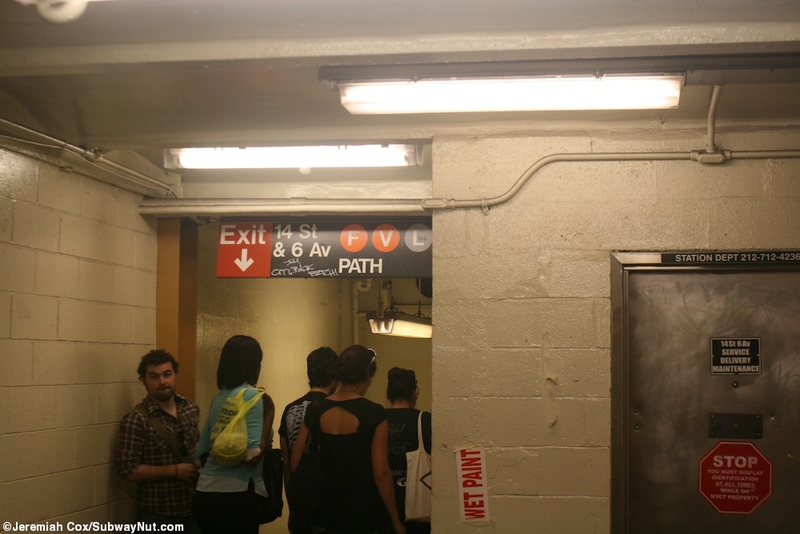 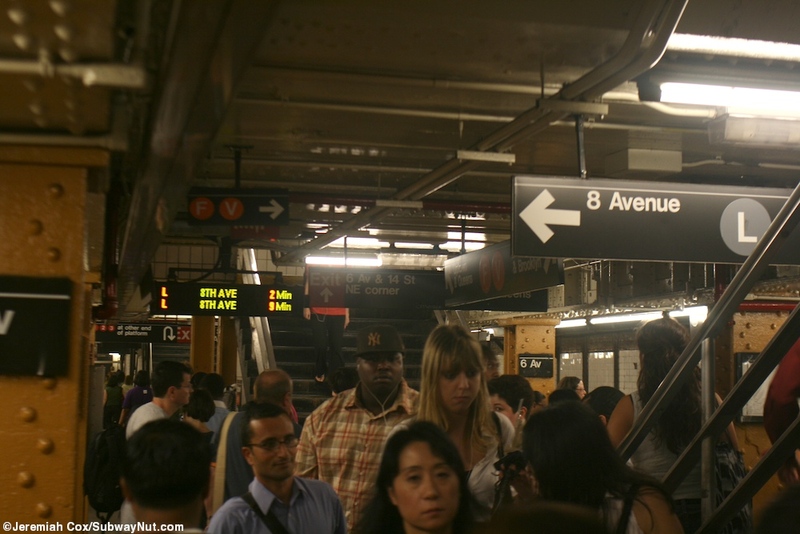 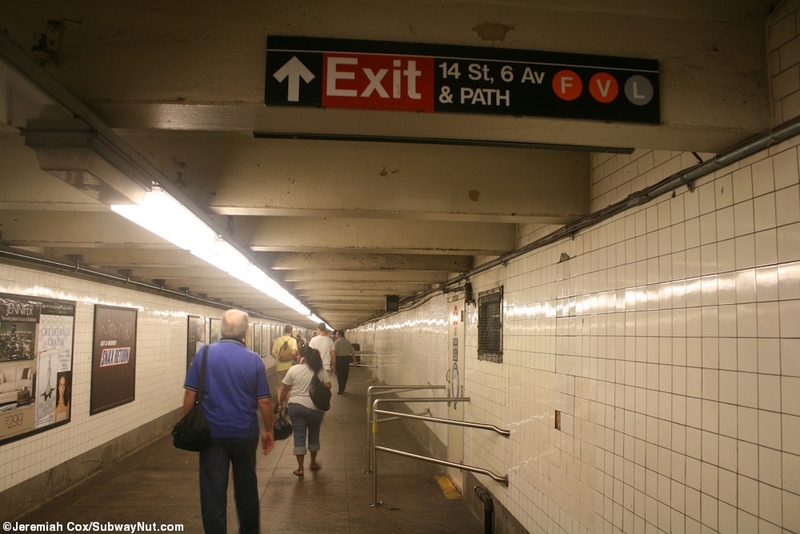 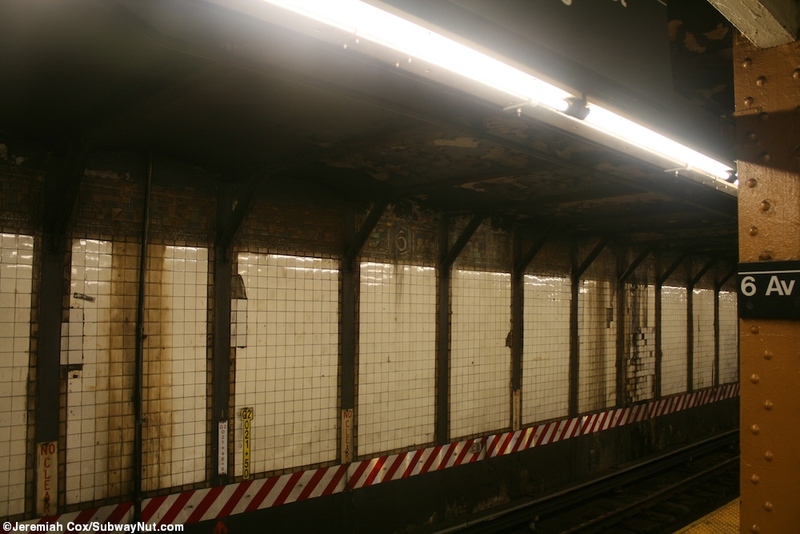 The station is deep crossing beneath both the Sixth and Seventh Avenue Subway lines and PATH trains but above the 6th Avenue Express tracks that bypass the station entirely due to the PATH station. 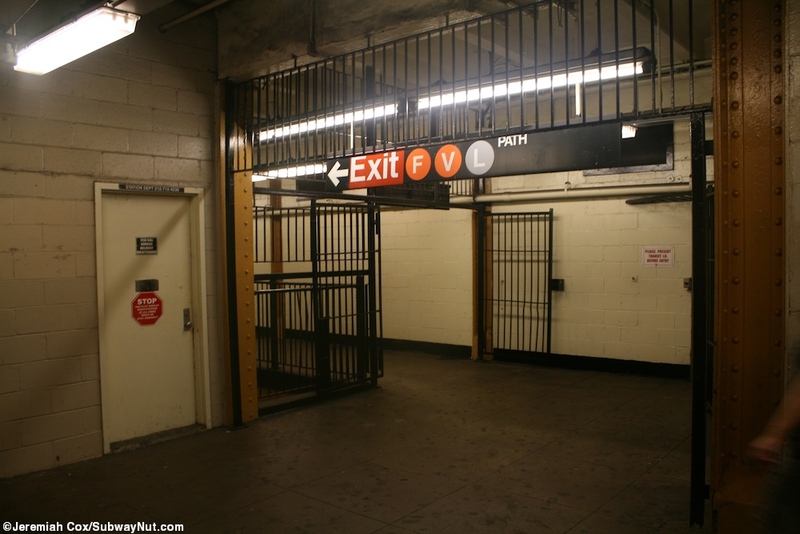 It has no street exits to call its own (and never even gets a full bullet on any entrance sign at either 6 or 7 Avenues) but its own bank of turnstiles that lead only to that platform. 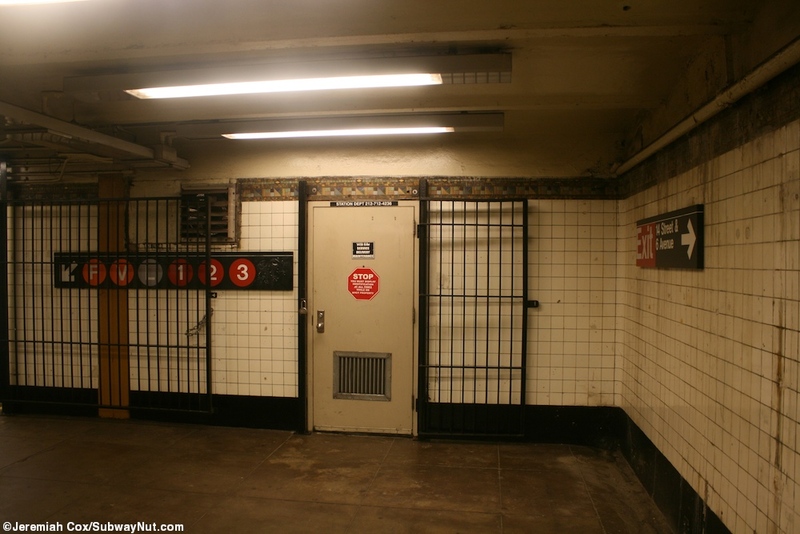 This bank of turnstiles is along the passageway between two streetstairs each at both the NE and SE corners of 14 Street and 6 Avenue that continues north to the main entrance for uptown F, M trains. 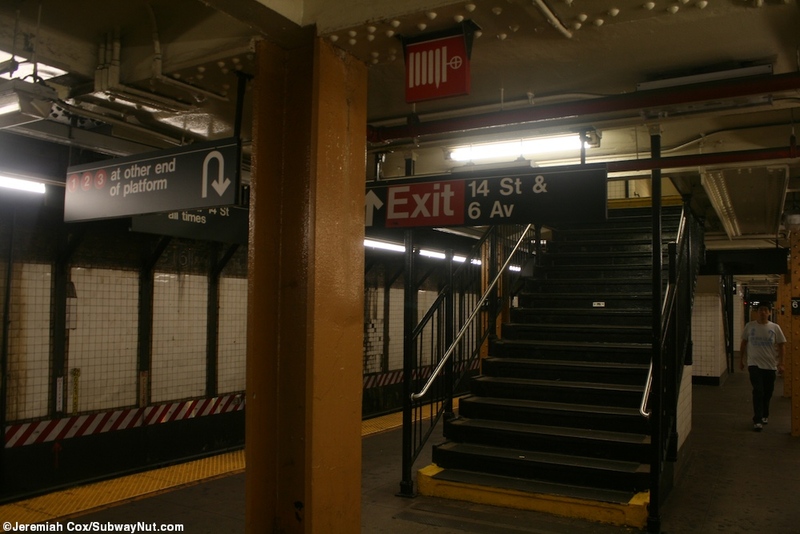 This bank of unstaffed turnstiles leads to a wide staircase down to an intermediate level where there are three narrow staircases down to that platform. 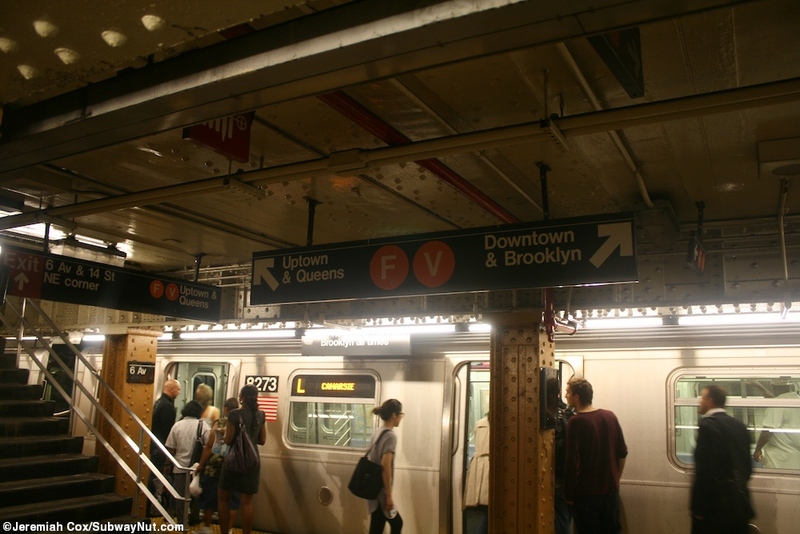 These are near the eastern end of the platform. 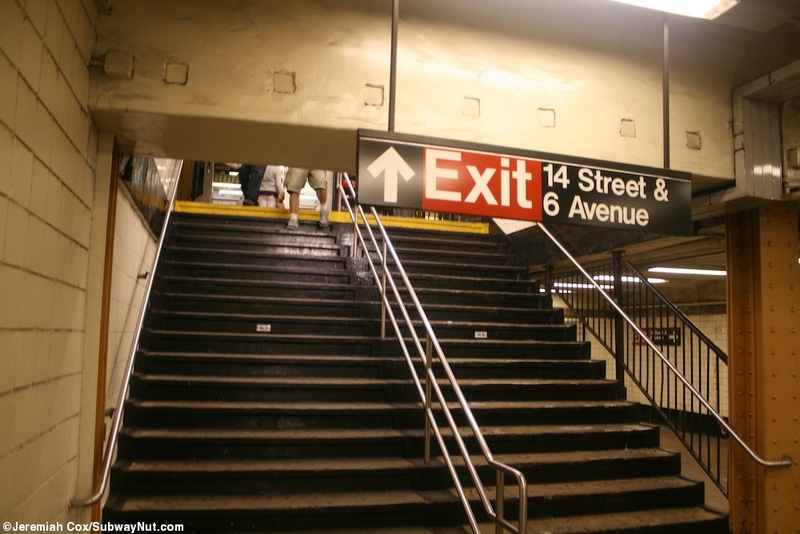 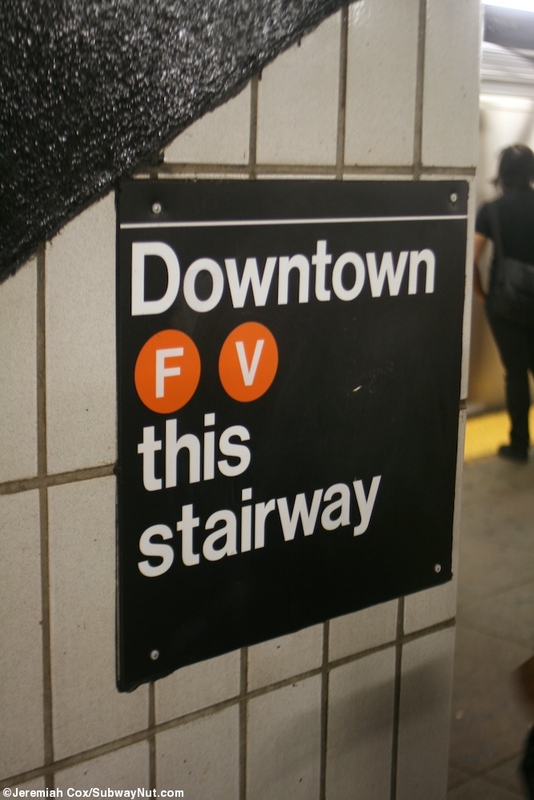 Continuing down are two staircases that arrive facing each other, relatively close together down (curving 90 degrees at an intermediate landing) from the extreme southern ends of each of the 6 Avenue Line's platforms. 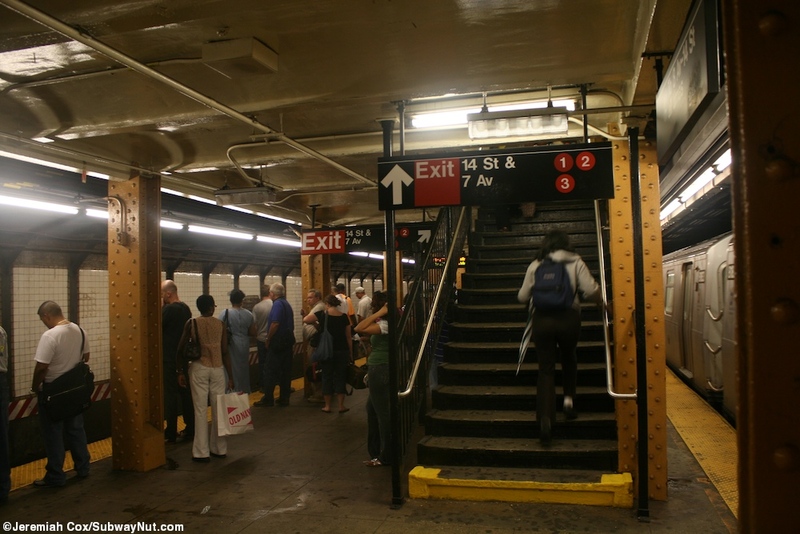 These staircases were obviously installed at a later date since the transfer became free in the 1960s with offwhite grayish tiles and square banisters, not the more traditional older looking staircases. 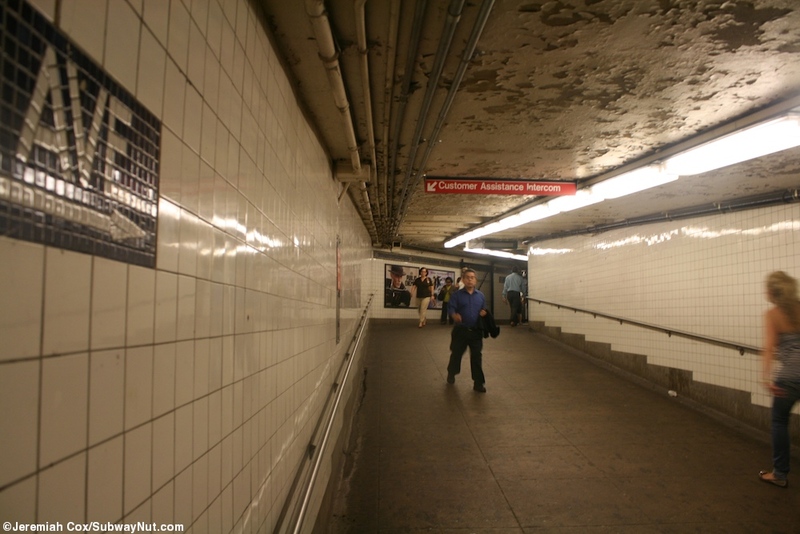 Towards the western end of the platform two staircases lead up to a small mezzanine surrounded by non-public rooms that is the beginning of the passageway to 7 Avenue made free in the 1970s, it is straight and flat with white walls before a few bends and it begins to ramp up towards the mezzanine for the 7 Avenue Line at 14 Street providing the free transfer.